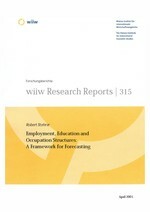 This paper introduces a model for forecasting changes in employment levels and structures by sectors, occupational categories and educational attainment levels which is then applied to the new EU member states (NMS) and Bulgaria and Romania. The model is based on the following ideas: As these countries face lower productivity levels as compared to the EU-15, the scope for technical change and catching up is quite large. Thus, if these countries converge to the EU-15 productivity levels at given trajectories, real income levels are also changing, which implies changes in demand and thus output structures by Engel curve effects. The latter are modelled as convergence to the EU-15 output structures. These factors, i.e. changes in productivity levels and output structures, in turn imply changes in the level and structure of employment. For making the forecasts we estimated the speed of convergence in productivity levels by sectors and the sectoral output shares econometrically from a larger country sample (including mainly EU countries). From these estimates and the initial levels, forecasts of convergence patterns for productivity levels and output shares are calculated, which are presented for the period up to 2012. A further decomposition with respect to occupational categories and educational attainment levels allows to forecast labour demand with respect to these groups.